G. Michael Graham Photo. Newport Central Catholic's Michaela Ware (white) and Beechwood's Madison Williams go after the ball in Saturday's game while teammates converge. NewCath won 5-0 to win the All "A" 9th Region crown at Farris Park. COVINGTON – It has been a while since the Newport Central Catholic Lady Breds soccer team has been to the All “A” State Tournament. NewCath took a step closer to making it to Elizabethtown with a 5-0 victory over Beechwood at Farris Park on Saturday. NewCath advances to the Sectional contest against either Paris or Bishop Brossart after the regions were separated this year. The two play for the 10th Region crown on Sept. 7. NewCath captured three straight All “A” state titles from 2005 to 2007. That is mostly because NewCath has played in the same region with the St. Henry Lady Crusaders. St. Henry had won the previous five 9th/10th Region All “A” Tournaments and even captured the All “A” state titles in 2008, 2009 and 2011 in addition to winning the overall state championship in 2010 to go with All “A” State runner-up finishes in 2010 and last year to Lexington Christian. But St. Henry chose not to partake in the All “A” Tournament this year. Scheduling may have been the big issue. Freshmen forward Taylor Tolle led NewCath with a hat trick of three goals and junior midfielder MiKayla Seibert scored the other two. Tolle credited her teammates for getting her in position to score. The Lady Breds outshot the Lady Tigers, 18-5. NewCath goalkeeper Meg Martin saved all five Beechwood shots and Cara Schwartz recorded 13. NewCath did a good job defensively in front of Martin. The Lady Breds booted out all the balls that entered their defensive box. The Lady Breds played without six key players Saturday. Three seniors were already out in Sam Bunzel, Amanda Schabell and Caroline Kinnett. Kinnett is out for the year with Bunzel and Schabell possibly returning soon. Then during the game, Chandler Cain, Allie Otten and Donnelly Simmins came out because of either injuries or heat exhaustion. All could return soon. The temperatures hit the 90s Saturday. But NewCath covered its bench to give the players and coaches shade while Beechwood’s bench was shaded by trees. The teams played four 20-minute sessions because of the heat. Tolle scored her first two goals a minute into the game and with 22:15 remaining in the first half. Seibert received her first goal toward the end of the half by booting a corner kick that Schwartz tried to play. But it went off her into the goal. NewCath put the game away in the second half. Seibert scored her second goal with 16:45 left in the game and Tolle added her final one with 8:15 left. NewCath travels back to Farris Park to face Holy Cross on Wednesday. Game time is 5 p.m. The Bluebirds (2-2) held the Bearcats without a shot in a Saturday afternoon contest at Tower Park. Andrew Barnes, Cole Davis-Roberts, Nathan Tippenhauer, Jimmy Penrod and Vadim Lightner all scored for Highlands. Teammate Jordan Jarvis tallied two assists with Penrod, Logan Groneck and Eric Schurr making on each. Highlands travels to defending 9th Region champion Boone County on Tuesday. Game time is 8 p.m. This in-county game might become a great rivalry one day. But on Friday, it was all Blue and White after the first quarter. The Highlands Bluebirds rolled to a 50-8 victory over the visiting Campbell County Camels in the 60th overall meeting between the two teams, but first since 2004. Highlands ended up outgaining Campbell County, 402-196 in total offense. Quarterback Drew Houliston led the way completing 18-of-26 passes to nine different receivers. Zach Harris tallied 72 yards rushing on 10 carries and three catches for 90 yards for four touchdowns to lead Highlands and Alex Veneman had three catches for 97 yards. The Bluebirds took the lead for good when Houliston completed two shovel passes to Zach Harris for 48 and 35 yards respectively. Highlands led 14-0 with 6:32 left in the first half and 22-0 at halftime after Harris scored on a 7-yard touchdown run and Ryan Greene scored the two-point conversion on a reverse. The Highlands offensive line once again blocked well. The Camels sacked Houliston just once. Quarterback Avery Wood led Campbell County completing 13-of-27 passes for 131 yards. He also rushed for 50 yards on 12 carries. The Camels drove inside the Bluebird 20 twice in the first quarter. But the Highlands defense held Campbell County to no points in the Red Zone. Highlands Assistant Head Coach/Defensive Coordinator Brian Weinrich was not pleased with the Bluebird defense despite allowing just the one Camel score in the fourth quarter. It came when Wood found Nate Hess for a 45-yard touchdown with 6:20 left in the game. The Camels tried to throw a lot of out routes to Jake Zabonick. Zabonick finished with six catches for 62 yards. Highlands played without senior defensive lineman Seth Hope. The Cornell commit decided to rest because of a left ankle sprain. Highlands added two touchdowns in the third quarter. Harris had a 9-yard touchdown run and Veneman caught a 75-yard touchdown pass from Houliston. Ryan Greene set up the play running a reverse the first time and faking it the second time and the offensive line gave Houliston plenty of time on the play. The Bluebirds extended the margin to 43-0 when Jaylen Hayes scored on a 15-yard touchdown pass. After Hess’score made it 43-8, sophomore running back Nicholas Kendall returned the ensuing kickoff back 93 yards for a touchdown. The Kentucky High School Athletic Association moved the mercy rule down to a 36-point margin as opposed to 45 last year. The running clock does not stop if the opponent cuts the margin below 36 points like Campbell County did in the fourth quarter. The running clock begins at any time during the game as opposed to the second half like the orginal rule made in 2001. Other states have the mercy rule lower. Florida sets its rule at 35 and Georgia goes even lower at 30. That will make it difficult for Highlands to match the 2011 team’s state record of 849 points in a season. The Bluebirds put up 781 points last year. Highlands continues action Friday against Lexington Bryan Station (1-0). The Defenders take on 2012 Class 5A champion Bowling Green at Lexington Catholic at 5 p.m. today. G. Michael Graham Photo. Highlands running back Zach Harris (center) takes the handoff in the Bluebirds' 50-8 win over Campbell County on Friday. The Bluebirds improved to 51-9 all-time against the Camels with the win. Hydration is a big thing during the early warm months of the season. Games have been played in 80-degree temperatures to start the season. But that does not bother Highlands Bluebirds football team because of its depth. The Bluebirds are 2-0 after a 50-8 win over Campbell County on Friday. The Bluebirds have a new water system this year. Bluebird defensive end Jake Parker also said drinking a lot of Gatorade helps prevent cramps. Highlands has not scored any points in the first quarters of either game this year. But the defense has come through holding University Christian (Florida) and Campbell County to a combined three points in that quarter. But it’s been different in the other three quarters. The Bluebirds outscored the Fighting Christians and Camels, 97-22 the rest of the way. Highlands has scored at least 22 points in two quarters this year. The Bluebirds posted 27 in the third against University Christian and 22 in the second against Campbell County. Campbell County Head Coach Stephen Lickert fell to 0-3 all-time against his alma mater. The former Bluebird running back and inside linebacker also coached against Highlands twice as head coach at Covington Holmes. The Bluebirds dominated both of those meetings. 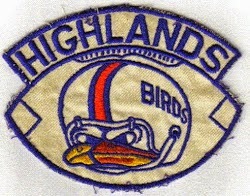 Highlands won the 2007 and 2008 meetings, 52-14 and 70-8 respectively. The 1997 Highlands graduate helped the Bluebirds to their first state championship under Mueller in 1996. The downed Hopkinsville, 21-14 in the 3A title game that year back when there were four classes. The Bluebirds continue to develop players with nearly 100 on the roster. Junior James Grau saw some action last night after the game was out of reach for example. This lets the coaching staff see them on film and evaluate them. The Bluebirds had no turnovers against Campbell County, but did manage to take away two. Both came in the second half. Highlands junior defensive back Griffin Urlage picked off an Avery Wood pass and Parker recovered a fumble on the second-half kickoff. Highlands improved to 51-9 against Campbell County in the all-time series. The Bluebirds have also played Dayton and Covington Catholic 60 times each in school history. They are 43-17 against the Colonels and 47-10-3 against the Greendevils. The only other schools the Bluebirds have faced more than Dayton, Campbell County and Covington Catholic are Covington Holmes 71 times Dixie Heights with 70 meetings. The Bluebirds are 49-20-2 against the Bulldogs and 62-8 all-time against Dixie Heights. Highlands moved to 196-55-10 against opponents in Campbell County all-time with the win. The Bluebirds had not played any team within the county since 2004 prior to that game. The Bluebirds have not played Dayton, Bellevue and Newport in a while and have not battled Newport Central Catholic since 1998. Highlands is 30-12-4 all-time against Bellevue, 46-17-3 against Newport and 22-7 against NewCath. Many teams do not reschedule the Bluebirds after taking beatings like this. But Campbell County plans to do the opposite for now. Highlands rival Covington Catholic did manage to hold off Dixie Heights, 21-13 to move to 2-0. The Colonels played without quarterback Adam Wagner (knee) and running back Luke Bir (shoulder). The Colonels will be tested in a week when defending Ohio Division I champion Cincinnati Moeller comes to town. Game time will be 1 p.m. in Park Hills. Covington Holmes (1-1) took one on the chin Friday as Scott pounded the Bulldogs, 40-14. Holmes travels to Lloyd Memorial on Friday. Harrison County travels to Grant County today to play in the Commonwealth Counseling Bowl at 5 p.m. The Thorobreds (1-0) are trying to double last year’s win total. G. Michael Graham Photo. The Newport Central Catholic Thoroughbreds line up in their recent win over Ashland. NewCath fell to Cooper, 31-22 on Friday in the Skyline Crosstown Showdown at Dixie Heights. Most teams who come out plus-four in the turnover department win football games. But that did not happen for the Newport Central Thoroughbreds in the Skyline Crosstown Showdown at Dixie Heights on Friday. The Cooper Jaguars still moved the ball better in a 31-22 victory. Both teams are 1-1 on the season. Cooper lost all six fumbles and the Thoroughbreds threw two interceptions. But the Jaguars outgained the Thoroughbreds, 376-209 in total offense. NewCath could not stop the balanced Cooper attack. Jaguar quarterback Will Ludwig completed 17-of-29 passes for 214 yards and three touchdowns in the win. His top target was Corey Fussinger. Fussinger had six catches for 77 yards and Aaron Morgan had five catches for 41 yards. The Jaguars also saw running back Avery Bricking run the ball 17 times for 125 yards. Defensively, the Jaguars made things tough for the Thoroughbred offense. Jacob Newumann recorded eight tackles and four sacks with Fussinger adding another two sacks. NewCath quarterback Mac Franzen completed 8-of-15 passes for 135 yards. Tommy Donnelly led the Thoroughbreds in that department with two catches for 63 yards. The Thoroughbreds led 7-0 after the first quarter. Michael Runyon hauled in an 11-yard pass from Franzen. But Cooper came back to tie the game when Bricking broke free for a 45-yard run in the second quarter. NewCath took its final lead in the second quarter when Jacob Weiland recovered a Cooper fumble in the end zone. But Logan Turner hit a 25-yard field goal to cut the lead to 14-10 at halftime. The Jaguars pulled away with 21 consecutive points in the second half. In the third quarter, Ludwig hit Fussinger for a 9-yard score and Morgan for three yards to give Cooper a 24-14 advantage. The Jaguars made the score 31-14 in the fourth quarter when Tanner Kissel hauled in a 21-yard pass. NewCath’s lone score of the second half came when Jack Sutkamp scored on a 2-yard run. Donnelly hauled in the two-point conversion pass from Franzen. The Thoroughbreds hit the road Friday for an in-county game at Campbell County. Game time is 7 p.m. in Alexandria. G. Michael Graham Photo. Highlands junior midfielder Allison Nienaber (right) converges on Notre Dame's Lily Weber (18) in Thursday's game at Tower Park. The Pandas won 3-0 to make it four wins in a row over the Bluebirds. It is still considered a great girls soccer rivalry. But lately, it’s been dominated by the Notre Dame Pandas. That continued Thursday as the Pandas (3-1) knocked off the host Highlands Bluebirds, 3-0 at Tower Park. The two consistently battled for region championships until last year. The Pandas have won four in a row in the series dating back to Highlands’ 2-0 win in the old 10th Region championship in 2010. Notre Dame won the state championship in 2011 before finishing runner-up last year. Neither team took a lot of shots thanks to good defensive efforts on both sides. But the Pandas outshot the Bluebirds (1-1-2), 6-2 and capitalized on half of the shots. Highlands goalkeeper Sara Owen recorded three saves with Panda goalkeepers Courtney Hansel and Maddie Kim combining to stop both Highlands shots. Highlands and Notre Dame have both won two state championships each. The Bluebirds won consecutive crowns in 2005 and 2006 while the Pandas captured their titles in 2004 and 2011. Both teams have a good mix of veteran and young players. But the Pandas did a better job in the midfield. Ellen Combs put the Pandas on the scoreboard with a goal in the game’s first five minutes. That proved to be the only goal Notre Dame needed. But the Pandas still added two insurance goals in the second half. Paige Kellam took a nice pass from Nica Berling in the attacking box and scored with 29:32 left in the game before Megan Barberich crossed a nice pass to Ashley Justice for the final score with 17 minutes left in the game. Highlands did not have anyone closely marking Barberich on the last goal. Kearns said that needs to change if the Bluebirds are to beat teams like Notre Dame. Notre Dame did receive a lot of corner kicks, especially in the second half. But the Pandas often could not get off shots. Converting corner kicks into goals has been a strong point for Notre Dame in the past. Kearns did note some positives from the game. He said everyone is healthy. This game marked the return of last year’s leading scorer in sophomore Brooklynn Rivers from injury. Health was an issue in last year’s team-record low three-win campaign for the Bluebirds. Then-seniors Ava Abner and Kara Painter suffered season-ending injuries near the start of the season. G. Michael Graham Photo. Newport Central Catholic junior midfielder Noah Connolly (white) battles a St. Henry defender for control of the ball in Thursday's All "A" 9th Region championship game. The Thoroughbreds won 5-1 to improve to 3-1-1 overall. SILVER GROVE – The long-term goal for the Newport Central Catholic Thoroughbreds boys soccer program is about pride. This program is the only male program in the school that has not won an All “A” state championship. They’d love to join the NewCath basketball and baseball programs that won the All “A” championships last year in addition to the football team winning the Class 2A title. On the female side, the basketball and soccer teams have captured All “A” state championships. While there is still a ways to go, the Thoroughbreds took a major step Thursday at Morscher Field near Silver Grove. NewCath started off hot and beat the rival St. Henry Crusaders, 5-1 in the All “A” 9th Region championship game. NewCath scored two quick goals and added to that lead. The Thoroughbreds led 4-0 at halftime. They may not have played a great second half. But it was more than enough to advance in the tournament. NewCath (3-1-1) plays the 10th Region winner in a sub-sectonal game at a time to be announced. The 10th Region All “A” Tournament has not started yet. But it has to be completed by Sept. 22. The state tournament takes place in Elizabethtown on Sept. 28 and 29. McDonald said he expects the opponent to be rival Bishop Brossart, which finished 21-2 a year ago including a 2-1 win over NewCath in the 9th/10th All “A” semifinals. The region tournaments separated this year unlike previous years. NewCath did make the All “A” state tournament two and three years ago. The Thoroughbreds lost to Bardstown Bethlehem, 3-2 in the semifinals in 2011 after falling 5-1 to Danville in the quarterfinals in 2010. Matt Tolle scored two quick goals just four and seven minutes into the game to put NewCath up for good at 2-0. Junior Ryan Randle and senior Evan Brannon scored with about 12 and two minutes left in the half to give the Thoroughbreds the comfortable 4-0 halftime lead. St. Henry (3-2) did score on an indirect kick in the first half. But the goal did not count because the Crusaders were ruled offside. St. Henry did dent the scoreboard in the second half. Cory Eibel scored as NewCath had problems clearing the ball. But NewCath did clear many balls in its defensive box. Minutes later, the Thoroughbreds responded. Patrick Louis scored on a penalty kick to make the final score. NewCath outshot St. Henry, 13-4. Goalkeeper Kevin Cawley made eight saves for the Crusaders and Paul Grosser made three for the Thoroughbreds. Both teams played 4-4-2 (defender-midfielder-forward) attacks. But St. Henry had its sweeper high and NewCath took advantage of it. The Thoroughbreds continue action Tuesday at home against Cooper. Game time is 6 p.m.
For those that like offense, this boys soccer contest gave plenty of it. The Highlands Bluebirds (1-2-1) traveled across the river and tied the Cincinnati McNicholas Rockets, 4-4 on Thursday. McNicholas resides in the Greater Catholic League Central Division. Chris Garbig led Highlands with two goals. Colin Dean and Logan Groneck scored the other two. The Bluebirds scored their last two goals with just 10 players. Nick Breslin and Nathan Tippenhauer again split halves at goalkeeper. Both recorded four saves each. The Bluebirds take on Walton-Verona on Saturday back at Tower Park. Game time is 11:30 a.m. The Bluebirds continued to struggle in Florence on Thursday falling to 0-5 to start the season. Jessica Ginter again led Highlands with 10 kills. Teammates Mallory Seidel followed with 12 digs. Izzy Schultz added eight aces and Kaitlin Hall recorded 18 assists. Highlands returns to action Tuesday in its first 36th District contest of the year at Newport. Game time is 7:30 p.m.
G. Michael Graham Photo. Newport Central Catholic linebacker Jack Sutkamp lays out Ashland wide receiver Rj Washington in Friday's win while teammates Logan Neff (54), Kole Zenni (9) and Colin Hoover (6) converge. The Thoroughbreds hope for more hits like that during the year defensively. The Newport Central Catholic Thoroughbreds football team tends to reload with the best in Kentucky. Their opponent Friday hopes to develop that same consistency. The Thoroughbreds face the Cooper Jaguars for the first time in school history at 6 p.m. in the Skyline Crosstown Showdown at Dixie Heights. Both teams are coming off successful 2012 campaigns. The Thoroughbreds won their fifth state championship with a 30-26 win over the Caldwell County Tigers in the Class 2A state championship and the Jaguars lost to Bowling Green, 34-20 a few hours later. The two squads experienced different results in their season-openers on Friday. NewCath defeated Ashland Blazer, 37-26 and Cooper lost at in-town rival Ryle, 17-10. Cooper’s head coach is Randy Borchers. Like NewCath Head Coach Dan Wagner, Borchers graduated from NewCath in 1996 so they both played for longtime head coach Bob Schneider. Both teams have things they need to improve upon entering Friday’s game. The Thoroughbreds want to tackle better in their 4-4 defense. Ashland running back Quentin Baker recorded 238 yards rushing on 18 carries and two touchdowns Friday. NewCath faces another good skill position player on Friday in Cooper Senior wide receiver/defensive back Aaron Morgan. Morgan had one rushing for a minus-6 yards but did haul in four catches for 79 yards and a touchdown against Ryle. Morgan recorded 37 catches for 734 yards and seven touchdowns last year. Both teams run Spread offenses. Cooper’s inexperience showed in the loss to Ryle. The Jaguars gained just 168 yards of total offense in the game. They graduated their leading rushers from last year in A.J. Morgan and Tyler Morris. The Thoroughbreds put up 360 yards in total offense against Ashland, including 304 on the ground. Quarterback Mac Franzen rushed for 103 yards on 11 carries and sophomore Jacob Smith had 86 on nine rushes. Franzen completed 3-of-7 passes for 56 yards. NewCath would not mind seeing more offensive balance and not turn the ball over four times like Friday. But things worked out there against Ashland. Cooper runs 4-3 and 4-4 defensive sets. Aside from Morgan, Will Ludwing is the Jaguar quarterback and senior running back/linebacker Avery Bricking returns along with senior wide receiver/defensive backs Corey Fussinger and Richie Pauls. NewCath is trying to rotate in more people defensively, especially in the trenches. The four teams that beat the Thoroughbreds last year did that. NewCath takes on three 6A opponents after this game. The Thoroughbreds will battle Campbell County, Dixie Heights and Simon Kenton following this game. The Newport Central Catholic Thoroughbreds girls soccer team advanced to the 9th Region All “A” Classic with a 1-0 semifinal win over Villa Madonna on Wednesday. Chandler Cain scored the one goal for NewCath. Villa Madonna only took one shot and NewCath goalkeeper Meg Martin saved it. The Thoroughbreds return to Eva Ferris Park in Covington on Saturday for the championship. Game time is Noon. The Thoroughbreds (2-3) handled the defending 10th Region champions on Wednesday in Alexandria. The scores were 25-18, 26-24, 25-17. NewCath trailed 2-13 in the second game before making a comeback. Alyssa Maier recorded 21 assists and 10 digs to lead NewCath and Rachel McDonald recorded 12 kills. Three other Thoroughbred hitters in Jamie Lohr, Nikki Kiernan and Keyaira Lankheit recorded five kills each and Madison Volk had 14 digs. NewCath plays host to Covington Holy Cross on Tuesday. Game time is 7:30 p.m.
G. Michael Graham Photo. Highlands wide receiver Brandon Hergott (middle) finds a lot of open space after making a catch in Saturday's game against University Christian while teammate Jensen Feggins (16) follows. The six-time defending state champion Bluebirds face Campbell County at 7 p.m. Friday. They do not want this football game to be about them. But when the pupil and staff are trying to implement similar concepts that have made the mentor and staff successful over the years, it’s a storyline that is hard to overlook. Highlands Bluebirds Head Coach Dale Mueller and Campbell County Head Coach Stephen Lickert both said they cheer for each other and their teams when they’re not playing each other. That one game takes place on Friday in Fort Thomas when the Bluebirds and Camels meet on the gridiron for the first time since 2004 at David Cecil Memorial Stadium. The 60th meeting between the two county rivals takes place at 7 p.m.
Lickert graduated from Highlands in 1997. The former running back and inside linebacker helped Highlands to the 1996 Class 3A state championship – a 21-14 win over Hopkinsville. That marked the first state championship for the Bluebirds under Mueller. Lickert owns a 48-51 record in nine seasons as a head coach. He previously led the Dayton and Covington Holmes programs before coming to Campbell County. The Camels won their first two district championships in 31 years under Lickert’s guidance in his first two years in Alexandria. Lickert is trying to implement some of the things he learned from his playing days at Highlands. The Camels and Bluebirds both run Spread offenses. The explosive Highlands offense put up 518 yards in total offense in the season-opening 47-17 win over University Christian (Fla.). Senior quarterback Drew Houliston completed 21-of-30 passes for 373 yards and four touchdowns. Senior wide receiver Ryan Greene led the way with five catches for 73 yards and two touchdowns with tailback Zach Harris rushing for 115 yards on 12 carries and three touchdowns. Highlands has a number of players who can beat opponents. Houliston can throw to a number of wide receivers such as juniors Jensen Feggins and Justin Weyer. They do a great job running their routes and exploiting holes in opposing defenses. Highlands tends to wear teams down that do not two-platoon such as University Christian. But Campbell County has also two-platooned since Lickert took over as head coach in 2011. The Bluebirds will face a 3-3-Stack Camel defense. Highlands ran it before going to a 3-4 a few years ago. Senior defensive lineman Patrick Berkemeyer leads the way on that side for the Camels. The Camels come into the game off a 27-7 home win over the Newport Wildcats. Lickert said Campbell County needs to do a better job holding on third down. Newport’s lone touchdown came on an interception return in the fourth quarter so the Camel defense yielded no points. Senior Avery Wood took over at quarterback this year for standout Tyler Durham. Durham rushed for 1,829 yards on 262 carries and 25 touchdowns for an average of about seven yards a carry and completed 75-of-154 passes for 1,371 yards and 12 touchdowns with just four interceptions. Lickert said the Camels are still working on their passing game. The Camels also graduated a good running back in Tyler Walsh. Brandon Morris, Alex Howard and Eli Matthews had rushing touchdowns against Newport. Wood can throw to fellow senior wide receiver Jake Zabonick. The Campbell County offensive line is led by senior Logan Schneider. Highlands put constant pressure on the University Christian quarterbacks despite missing some key players because of injuries. That’s where the Bluebird depth came into play. Senior standout defensive lineman Seth Hope got chop blocked early in the game and suffered a high left ankle sprain. His status is maybe for Friday. Lickert knows about the unique atmosphere at Cecil Memorial Stadium. Teams often become intimidated by the surroundings. Lickert faced off against the Bluebirds as Head Coach at Covington Holmes twice in 2007 and 2008. Highlands dominated both matchups winning them, 52-14 and 70-6 respectively. The Bluebirds enter the contest 50-9 all-time against the Camels. The only other team Highlands has beaten more is Dixie Heights. The Bluebirds own an overall record of 62-8 against the Colonels. The Newport Central Catholic boys soccer team (2-1-1) advanced to the All “A” 9th Region championship. The Thoroughbreds were to face Villa Madonna. NewCath Head Coach Mike McDonald said the Blue Lightning dropped out of the tournament because they felt like they could not compete. NewCath plays host to St. Henry (3-1) for the region championship on Thursday. Game time is 6 p.m. at Morscher Field. The Bluebirds (1-2) dropped their second straight in a game at Tower Park on Tuesday. Highlands goalkeepers Nick Breslin and Nathan Tippenhauer stopped 8-of-9 Dragon shots. Breslin recorded three saves and Tippenhauer had five. The Bluebirds travel just across the Ohio River on Thursday. They take on Cincinnati McNicholas at 5:30 p.m. The Bluebirds continued their rough start to the season on the road falling to 0-4 traveling near Mason, Ohio. Izzy Schultz led Highlands with six kills and Jessica Ginter had four blocks. Kaitlin Hall added 18 assists and 15 digs. Highlands travels to Boone County on Thursday. Game time is 7:30 p.m.